The perfect tool for reducing high latency when playing online games and using online applications! In many cases high latency is caused by the lack of periodical operating system services, and by improperly configured internet, registry and network device settings. Latency Optimizer includes: tool, a system cleaner, a free ram tool, a connectivity fix, latency optimizer tool and an integrated speed test to boost your online experience! Packet monitor - lists network related information and objects as well as log traffic passing over your digital network. Latency Test - measures how quickly a small data packet can get from your workstation / laptop to a server somewhere located in the world and back. Startup Manager - stops unnecessary applications being loaded during the startup of your operating system. MCS System Optimizer 2008 is a tool to optimize memory and processor. Qweas is providing links to Latency Optimizer 3.0.1.0 as a courtesy, and makes no representations regarding Latency Optimizer or any other applications or any information related thereto. Any questions, complaints or claims regarding this application Latency Optimizer 3.0.1.0 must be directed to the appropriate software vendor. 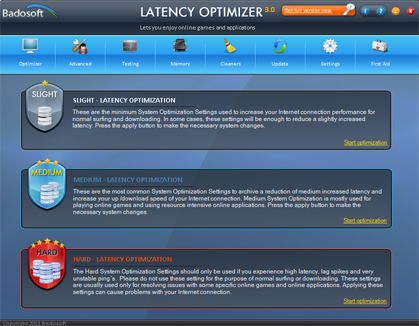 You may click the publisher link of Latency Optimizer on the top of this page to get more details about the vendor.